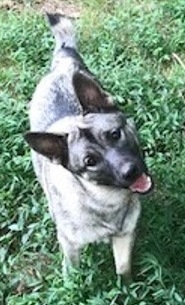 Norwegian Elkhound Rescue - Adopt a Pair! Nadia (born 11/23/2017) and Max (born 7/30/2017) entered rescue together as a result of their owner experiencing health issues. They have been together since January of 2018. As is expected for their age, they are very bonded and cue on each other. Both are altered, heartworm negative, and up to date with vaccinations. Max and Nadia are both high energy, but also love cuddling with their humans and are very loving. They play together wildly, wrestling and chasing, but have good boundaries with each other. Neither appears to have resource guarding issues, and a favorite game is playing chase with their toys. She loves a good tug o’ war with her moose stuffy and he likes to play soccer with a rubber Kong ball. When playing, they may forget the humans are not part of their games, and get mouthy or jump all over them. Neither has chewed household objects or furniture. Continued training and socialization with both dogs and humans is important for them. They lived in a household with cats. The former owner said Max had an understanding with their cats that was largely based on the cats being able to get somewhere else. He wanted to chase and play rough. Nadia was said to be good with cats. Outdoors, tight control on lead is necessary for both, since neither recalls presently and if they get loose, they may prove elusive. He adores walks, and can be very busy on the lead, but after a bit, redirects and settles down. She does not like being put on lead and will run from the lead, but once on and going on a walk is well-behaved and enjoys the walk. She has met new people and dogs on lead and was appropriate. She is very vocal, but submissive. A fenced yard is a must. Since they focus on each other, they should probably be separated when training. He tends to learn more quickly when not distracted by other dogs. They have both learned sit and shake, Max being the faster learner. Both are kissers and love tummy rubs. They like to sleep near each other, but have crated well and currently overnight in crates. They have no known health issues. Nadia has a straightened tail due to old, fused fractures. She has problems with anxiety and submission urination but is getting better as she learns to trust her humans. She benefits from a strict housebreaking routine. Early in a new relationship, she will be very tentative in approaching, and may bolt. After developing trust, she becomes your shadow. Her energetic excitement when you come home and greet her may result in potty accidents, but that should improve as she matures. 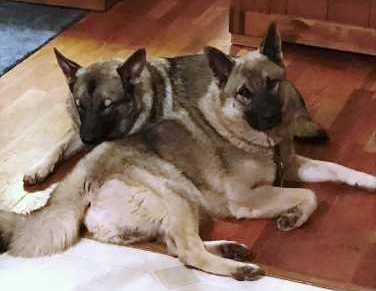 Although Max and Nadia would probably be fine if separated, they would love to stay together. 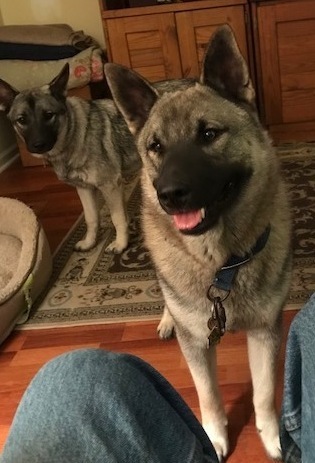 If you have the time and patience to bring this pair of wildly energetic and loving youngsters into your home, please click here to fill out an application to adopt and don't forget to mention their names. They would love to brighten your life with their antics.